Added by Indo American News on April 16, 2015. 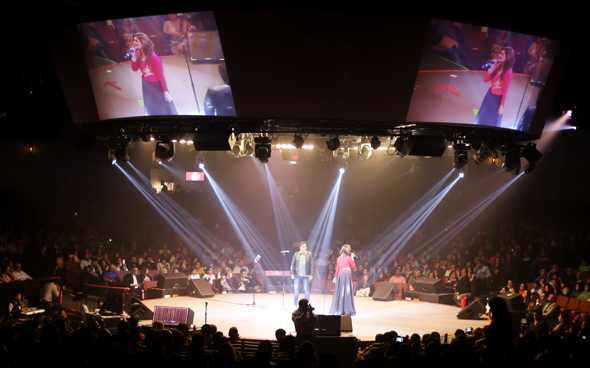 HOUSTON: Houston is no new city when it comes to Bollywood concerts and same is true for Bollywoodshows4u. Moid Khan and Irfan Moosa together have brought most of the biggest names in the Indian and Pakistani Entertainment Industry. They decided to make a come back together with fresh new talents in the Entertainment Industry. 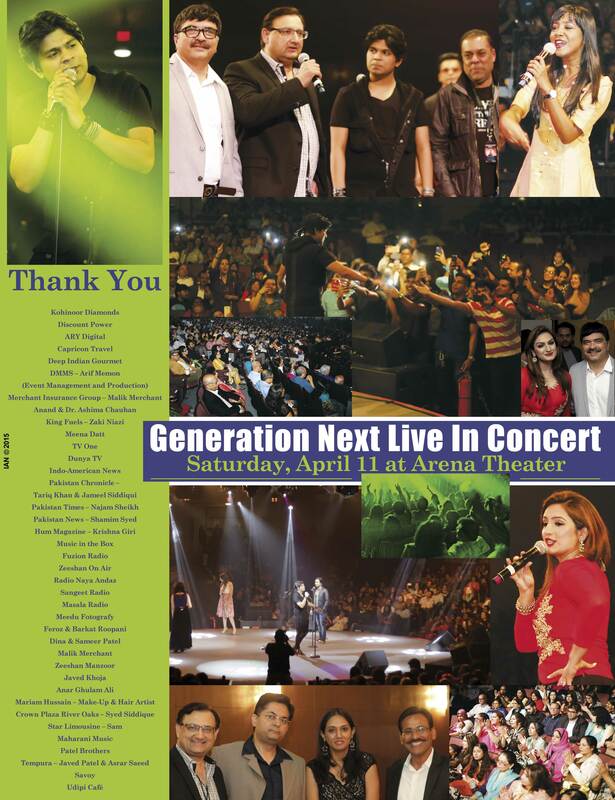 Generation Next featuring Ankit Tiwari, Akriti Kakar and Shilpa Rao were the best choice for the upcoming event. Doing a concert with seasoned artist who have already been to US several times and those show being Sold Out for various reasons is not the challenge that Moid and Irfan wanted to take, the challenge was to have a SOLD OUT concert with new artists as that takes a lot of effort from the promoter’s side. With just 8 weeks in hand and the support of people of Houston and the entire media of Houston they announced the concert. Arena Theater which has been a venue for many Indian and Pakistani artist was chosen for the concert. The day of the concert came in – the artists came down from Dallas where they had a concert before Houston and as the time of 8.30 was approaching the venue started buzzing with activities. Sound check was being done, the video was being checked, the lighting was being programed, the event managers from Cineyug’s side were co ordinating this event for about a month with Arif Memon and his company DMMS. The show started at 8.45pm with a guest performance by Payal Mitra, a local artist who was featured in SAREGAMA. Then the lights went off – the AV started and with a bang the foot tapping music started and Akriti Kakar came up on stage as the first artist of Generation Next and right from the first song Iski Uski she had the control of the audience this was followed by Saturday, Saturday and London Thumka. She was followed by Shilpa Rao who sang Khuda Jaane, Ishq Shava, Meherban Hua and Malan Malang the kind of energy that she was giving out on stage and getting the audience fired up was a surprise coming up from such a artist as looking at her no one would imagine the power in her voice. 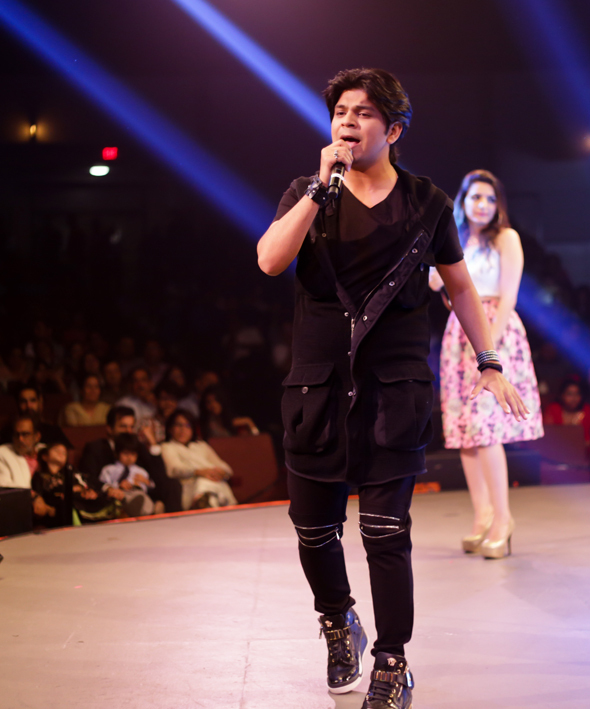 The audience was finally ready for Ankit Tiwari who made an entry singing Sun Raha Hai tu from backstage and running in the aisle towards the stage, the 2700 plus audience was going mad at his each word. That made Ankit more aggressive in his singing and he was totally the Rock Star of the evening. Tu Hai Ke Nahi was followed after the previous song and then he sang Katra and a special Medley of A R Rahman songs in his own style. 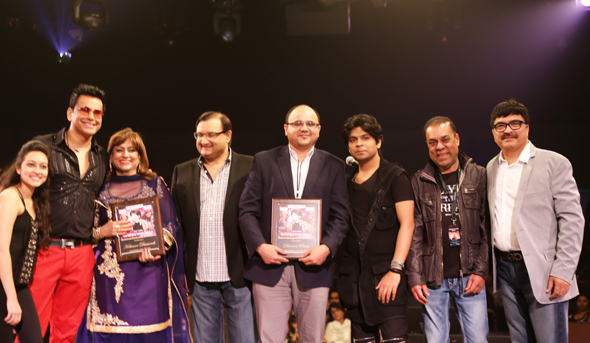 There was a small break in the concert to present the plaques to the presenting sponsors, Sunil Thakkar was the emcee for this part of the stage and Nilofer Ali of Kohinoor Diamonds and Malik Jamal for Discount Power came on the stage and received recognition from the Promoters Moid Khan and Irfan Moosa and the audience of Houston. The wait was finally over and Ankit sang the song Teri Galiyaan, the entire Arena Theater was singing with him and that brought in the end of the Generation Next. One thing that everyone noticed was that the Artist’s had the entire stage for themselves and the Orchestra was placed in the Pit which was quite a novelty to see or maybe we can say to hear. This being a start from Bollywoodshows 4 u will be followed by Shaan in Concert with LIL Champs on May 23 at the Arena Theater. The promoters would like the audience to voice their opinion about the concert and post pictures on the Facebook page of this concert. Moid Khan and Irfan Moosa thank each and every one for lending their whole heated support and welcoming Bollywoodshows4u with a SOLD OUT CONCERT and they are promising a big concert featuring Indian Film stars in the month of September 2015.